I try to read everything that's sent me - play scripts, movie scripts - but I've had to make a rule. If the author hasn't grabbed me by Page 25, the piece goes back with a note of apology. He later appeared in Hitchcock's Lifeboat (1944) and worked on the screenplays of Rope (1948) and Under Capricorn (1949). " It ran one season. However he sold the screenplay to RKO which later filmed it as The Locket (1946). 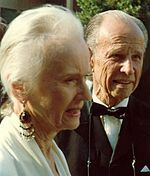 Hume Blake Cronyn OC (July 18 1911 – June 15 2003) was a Canadian actor of stage and screen who enjoyed a long career often appearing professionally alongside his second wife Jessica Tandy.